John Newton was famously familiar with grace. As a slave-trader turned clergyman, he was a living depiction of his much-beloved hymn, Amazing Grace. However, Newton’s experience of grace did not climax at conversion. In a less remembered hymn, I Asked the Lord that I Might Grow, Newton captures the tension which lies at the heart of every Christian life: sanctification and sin. Accepting Jesus as Lord and Saviour demands a whole-hearted and life changing pursuit of righteousness. The Bible commands us to flee from sin and God promises to mould us into the image of Christ. How do these truths coexist alongside the inescapable reality of sin? How do you embrace your identity as a new creation in Christ (2 Corinthians 5:17) when your old creaturely habits ensnare you? These are the questions Newton seeks to answer in I Asked the Lord to Grow. 200 years on, there is beautiful solace to be found in these words. Take heart. I asked the Lord that I might grow In faith and love and ev’ry grace, Might more of His salvation know, And seek more earnestly His face. ‘Twas He who taught me thus to pray, And He, I trust, has answered prayer, But it has been in such a way As almost drove me to despair. I hoped that in some favoured hour At once He’d answer my request And, by His love’s constraining pow’r, Subdue my sins and give me rest. Instead of this, He made me feel The hidden evils of my heart And let the angry pow’rs of hell Assault my soul in ev’ry part. Yea, more with His own hand He seemed Intent to aggravate my woe, Crossed all the fair designs I schemed, Humbled my heart and laid me low. ‘I asked the Lord to grow’ – Why? To understand sanctification in the way that Newton so clearly does, we need to hold fast to two equally true and yet divergent biblical principles. The first is this: before Christ comes again, we will continue to sin. Our flesh will wage war against us every second of every day. If you need confirmation of this, apart from the evidence in your own life, look at Paul’s distress in Romans 7:14-24 or John’s pleas in 1 John 3:9. Before Christ comes again, we will continue to sin. Our flesh will wage war against us every second of every day. The second truth is this: the moment we claim the eternal life purchased for us by Jesus, we are made new. The very Spirit of God dwells within us and transforms our hearts, giving us a new desire and strength to pursue sinlessness. It is only on that final day that this transformation will be complete but until then, we look forward to this completion by striving to see the work of sanctification done now. This is why John Newton prays that he ‘might grow In faith and love and ev’ry grace’, as he expectantly awaits spiritual growth. Newton also acknowledges that his prayer is in answer to a command, ‘Twas He who taught me thus to pray’. Jesus taught us to pray, ‘Your Kingdom come’, and this kingdom will firstly come in our hearts as we become more loyal citizens of it. What can we expect when we pray for sanctification? 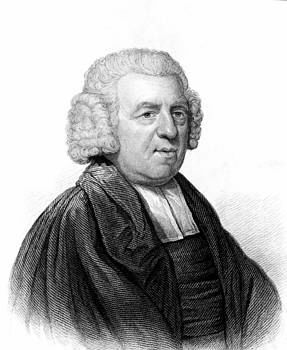 John Newton hoped for ‘some favoured hour’ in which God would ‘subdue my sins and give me rest’. When I pray to become more like Christ, I imagine and increased hunger for righteousness, hatred for sin and passion for witnessing. These are not wrong desires to bring before the Lord, He is more than able. Yet, often our experiences of Christian life often seem more like Newton’s: ‘He made me feel The hidden evils of my heart. And let the angry pow’rs of hell assault my soul in ev’ry part’. Our experiences of Christian life often seem more like Newton’s: ‘He made me feel The hidden evils of my heart. And let the angry pow’rs of hell assault my soul in ev’ry part’. Hatred of sin is evidence of re-birth in Christ. As we grow in sanctification, we struggle more with the ‘thorns in our flesh’ (2 Corinthians 12:7). This is not because the thorns increase, but because they appear increasingly ugly to us. Sin is not godly but anguish over sin is. When we pray for spiritual growth, God grants us new eyes to see our wickedness. May we, by his grace, use that vision to fight more determinedly against sin. Sin reminds us of our complete inadequacy before a holy God. There may be behavioural sins we feel we have ‘conquered’ through sheer will-power. In reality, our heart is still twisted and we have not conquered them at all. Falling back into this sin can be a wake-up call. Sin is stronger than us but our Saviour is infinitely stronger than sin and reigns victorious. Sin reminds us that we are unable to save ourselves. Temptation is a trial. Jesus was tested in the wilderness and did not surrender. So too, when we resist sin we are becoming more like Him who has no sin. When ‘these inward trials’ come, rejoice and fight mightily, knowing that it is an opportunity for sanctification. Sin drives you back to the cross, again and again. For those who rests securely in the family of God, sin is not a condemnation but a reminder of His unfathomable grace. John Newton desired comfortable sanctification but God had other plans. By showing him the ‘evils of his heart’ and the ‘angry powers of hell’ the Lord renewed the joy of Newton’s salvation. Newton prayed for ‘grace and faith’ and God answered powerfully by using the depravity of Newton’s sin to point him back to Jesus. Grace abounds as we seek forgiveness and faith increases as we marvel at the steadfast love of our God. The sweet truths of “I Asked the Lord that I Might Grow” are music to the ears of every saved sinner. We should pray for sanctification and God will answer. When that answered prayer comes in the form of struggles with sin, we need not despair. God will expose sin to show the glory of the cross. Our salvation is secure and our sanctification is promised. But, this wonderful assurance must not result in apathy. Let us be very clear, sinning does not sanctify. Sin wages war on our soul and must be fled from at all costs. The truth of Newton’s hymn and the Gospel it sings of is this: Jesus is victorious over sin and calls us to be too. In his kindness, he uses our brokenness to remind us of his completeness. He shows us his spotlessness by revealing our blemishes. May this urge us onwards to fight sin and pursue sanctification with all the strength we are granted in Christ’s death and resurrection. Brianna is a freelance writer and lover of all things literary and theological. Raised in the Blue Mountains and surrounded by Christian family, she came to faith within the Presbyterian church. She has spent time on the international mission field with Compassion Australia and has completed an internship with London City Mission. After some time living abroad, Brianna now lives in Sydney and studies Philosophy and Ancient Greek at the University of Sydney. She is passionate about helping churches better engage with the world around them for the sake of the Gospel.